We all love this phrase! Who wouldn’t like using data fearlessly without worrying that you’ll run out and slip to turtle speeds until the next billing cycle? When UniFi Basic first launched in July 2018, this entry-level package debuted at RM79/month with a 60GB monthly quota. That’s plenty of data for casual users, but the risk of exceeding your quota is real, folks. Worry no more until 15 February 2019, because TM’s celebrating New Year and the Lunar New Year with its double happiness time, unlimited quota, just for you! Now you needn’t worry about your visitors sucking your quota dry. If you got addicted to the unlimited quota, you can always upgrade to the UniFi 100Mbps plan, which features unlimited quota from the get-go. It costs RM129 a month, a RM50 increase over the UniFi Basic plan. Read the next point to decide whether it’ll be worth the jump (but why wouldn’t you love unlimited quota?). If you don’t want to get throttled to snail speeds upon exceeding your quota from 16 February 2019, TM now offers you the ability to buy buy more data as add-ons to tide you over till the next billing cycle. They’re now offering 1GB for RM10, 5GB for RM20, 20GB for RM40, and unlimited for one weekend (Friday to Sunday) for RM50. 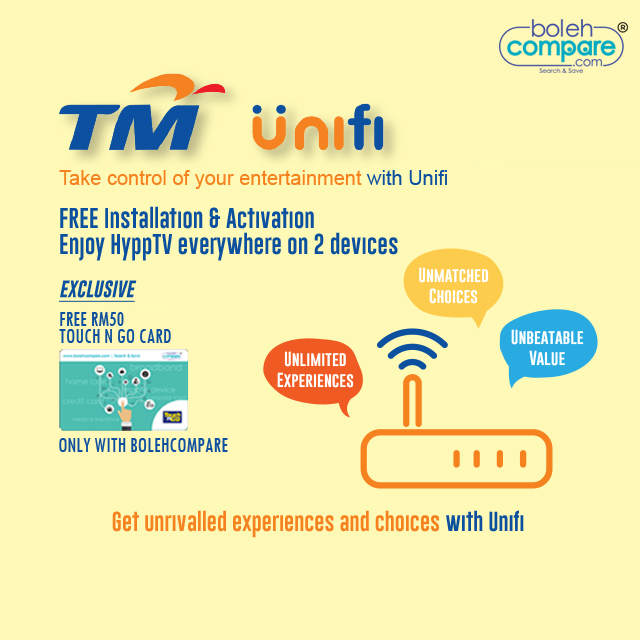 You can purchase the add-ons via TM’s website or the care@UniFi app. Are they worth the cost? Of course, if your prerogative is speed, then yes, probably. Otherwise, the most value-for-money add-on is the 20GB for RM40 pack, which will give you a total of 80GB for RM119 (RM79 + RM40). That’s just RM10 lower than TM’s 100Mbps unlimited quota plan. Track your data usage this month, see how much data you need, and decide smartly! Luckily for you, it’s not the end of the world even if you decide to go into basic survival mode after your 60GB quota is used up – or at least, not as badly as before. TM’s original throttle speed was 128kbps, which struggles to open websites, much less YouTube. Now, though, they’ve increased that threshold to 512kbps, which is half the speed of the cheapest Streamyx plan, so it’ll probably handle your Facebook or Googling habits adequately. Apparently the unlimited quota perk has been around for a while, quietly lurking without any advertisement. That’s really great for existing TM Unifi Basic subscribers, but if you want to be absolutely sure that you’re being a smart consumer, track your data usage this month and make your decision to upgrade or not after 15 February 2019!